I originally made these lotion bars for my husband. His primary job is as a rock mason and the mortar and rough stone often leaves his hands dry, cracked, and bleeding. At night, I put salve on them, and while that helped a lot, it just wasn’t enough. Lotion bars have a long history of helping the toughest cases of cracked, dry skin, while dandelion oil is particularly useful for alleviating the chapped skin and soreness that comes along with manual labor. This combination has been excellent for his skin. He rubs the bar over his hands several times while watching TV each evening. There’s no messy salve to deal with and he can use it on the spots that are most bothering him. To make these you’ll need to first make a dandelion flower infused oil. Right now, my back yard is filled with dandelions, so I’ve been making up large batches of oil to use for projects throughout the rest of the year. With proper storage, the oil should be good for around 9 months to a year. Gather flowers from places that haven’t been sprayed with chemicals or used as a bathroom site for your pets. Dandelions often have bugs or ants on them, so let the container sit outside for a few hours before bringing in. Since dandelions have a high water content, let the flowers completely dry for a few days before infusing in oil to avoid potential mold and bacterial contamination. Spread the dandelions out on a clean dishtowel or paper towels in a single layer to air dry. 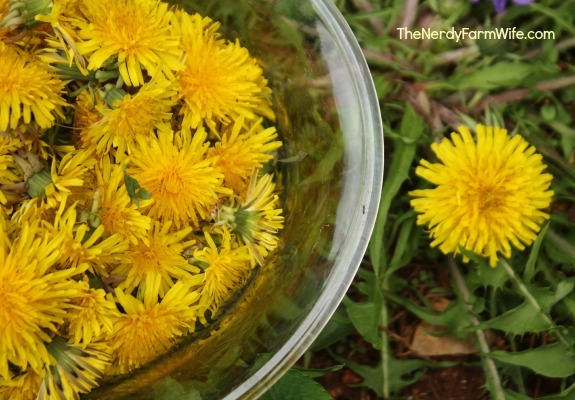 Fill a canning jar halfway with dandelions, then fill the rest of the way up with oil. I like using sunflower oil since it’s especially helpful for damaged skin. You can also use olive, sweet almond, avocado, hemp, and other such light oils. Set the oil and dandelion filled jar down into a pan of gently warmed water. Let the jar stay in the heated water, with the burner set to low, for a few hours then remove, cool, and strain. Keep a close eye on things to make sure the oil doesn’t overheat. Cover the jar and set in a warm place for about four weeks before straining. A sunny windowsill works well. 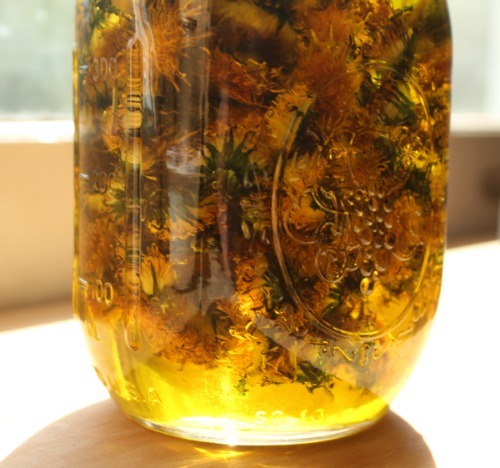 For more details about making the oil, check out my post on making Dandelion Salve, HERE. 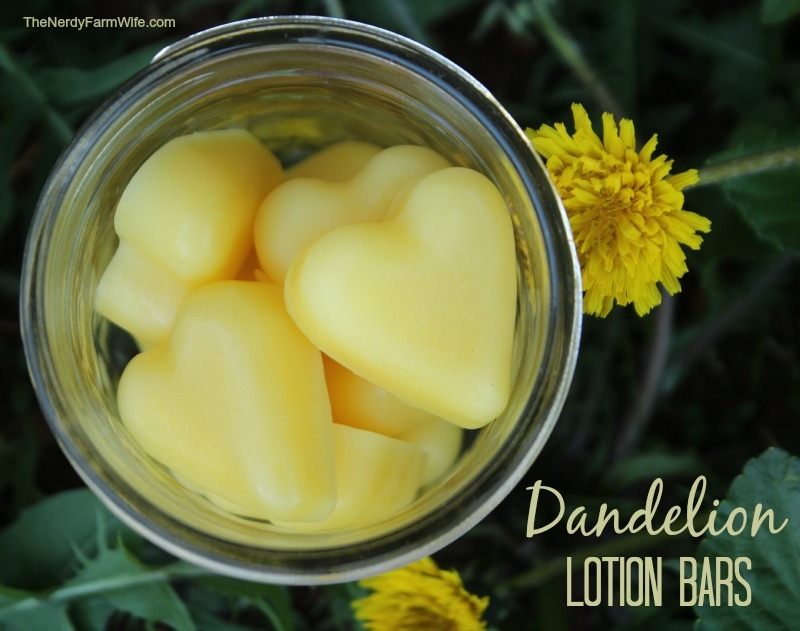 Once your oil is finished, you’re ready to make your dandelion lotion bars! They are super simple to make. If you can melt chocolate, you can make these. Measure out the beeswax, shea butter, and dandelion oil into a canning jar or heatproof container. I use a recycled tin can for this project for ease of cleanup. Set the container of ingredients down into a pan containing an inch or two of almost simmering water, creating a makeshift double boiler. Allow the water to indirectly heat the contents until the beeswax is melted. Overheated shea butter can get grainy, so keep a close eye on the mixture and remove from heat as soon as it appears melted. Optional: add a few drops of lavender or other skin safe essential oil, but I often just leave these plain. For my husband, I make rounds that fit perfectly in his hand, using a canning lid as a mold. Just set a canning lid with ring down on a sheet of waxed paper and pour the hot lotion bar mixture into it. Let it completely set up and cool, but not for too long, before turning upside down and pushing it out. Smooth the edges with your finger. You can store smaller sizes in a jar or tins out of direct heat and hot areas. Whenever your skin feels dry or rough, just rub the bar over your skin. The heat of your body will melt it just enough to leave a light moisturizing layer that absorbs in much quicker than a salve does. Did you enjoy this dandelion lotion bar project? Let’s stay in touch! 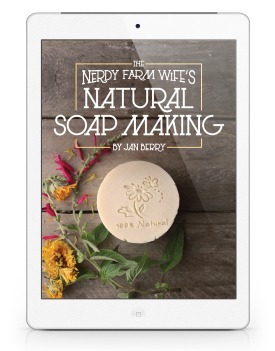 Be sure to sign up HERE for my newsletter, so you can get my latest soap ideas, herbal projects and other DIY body care recipes sent straight to your inbox two to four times per month! If you like the projects on my site, you’ll love my book, 101 Easy Homemade Products for Your Skin, Health & Home! Buy it today at the following places! Tagged dandelion, lotion bars. Bookmark the permalink. What a wonderful idea. This salve sounds so soothing and very convenient. Hi Lucy, I’m glad you like the idea! It’s very convenient to apply, for sure! Hi… can I substitute vegetable glycerin for shea butter??? Just curious. Hi Sarah! Vegetable glycerin has very different properties than shea butter, so won’t substitute well in this recipe. If you have a different kind of butter you can use – like mango, avocado, cocoa or kokum, those could work well instead of the shea. I love this. I make dandy lion jelly, but have not used them in lotion bars before – will have to give it a try. Hi Lady Locust, Yum, dandelion jelly is one of my favorites. I hope you like the lotion bars! This sounds wonderful. I’ve never made a lotion bar before, but now I want to! I know you love dandelions, Jan, but I, admittedly, have been a ‘non-believer’ until very recently (I’m one of those people who regularly mows down these ‘weeds’). My viewpoint changed, however, when Carolyn (‘The Other Farmer’) mixed individual dandelion heads in panko bread crumbs and fried them up for dinner. Delicious! Now my mind is open to other possibilities! Thanks, as always, for sharing. When I was very young I lived with my grandmother, she would cut the dandelion leaves when they were very young (before flowering) wash them up and serve as a salad with hot bacon grease poured over them, I imagine we could come up with something besides the bacon grease. This was one of the very first fresh foods of the spring. Hi – love your recipe and want to give it a try. however, I find I am very sensitive to the scents of both shea and mango butter (more the shea). Are there any other butters you would recommend trying? Thanks! Wow! I love these. I’m no stone mason, but my hands are kinda chapped, I’m excited to whip up a batch! Hi Connie, I hope you like them! What a cool idea! Thanks for pinning! Just let me know if you want to pin there – pretty much everything on your Fun for the Kids and Homeschool would be appropriate, and all your fun herbal posts. Is that Herbalism board yours? I would love to join that board, if you’re not opposed. The Non Toxic and Natural one would be great, too! My pin name is HomesteadLady. Cheers! BTW, have you heard of The Homestead Bloggers Network? You would be a great fit! Thanks! :) I have indeed heard of the Homestead Bloggers network – it seems like a lot of my favorite bloggers are there. I just get hung up on the having to sign a form to join, but otherwise it does sound great! Jan, what a wonderful idea! DDs and I picked as many dandelions as we could before the menfolk mowed. I made these lovely little lotion bars and can NOT keep my hands off them. I smooth them on my lips, too. The color and texture are wonderful. THANK you for this recipe and thank you so much for your generous sharing! God bless. I’m so happy to hear that you like the lotion bars! That’s a great idea to use them on your lips too! Thank you for this amazing recipe! My husband also has very roughened “work hands,” and these bars actually helped immediately! I think over time, he will not have the cracks he has now! I am so glad I found your website! Looking forward to trying this recipe. I’m a registered nurse and the constant washing and using hand sanitizer is very hard on my skin. Thanks so much! 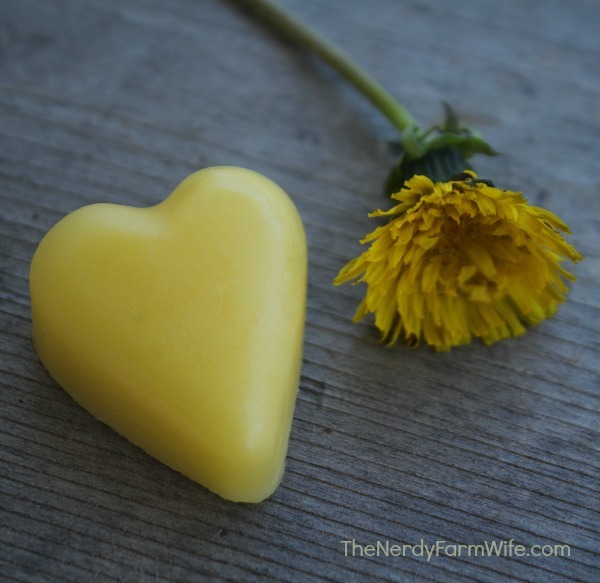 I have made lotion bars before (and they looked very like yours – I think we may have the same heart molds) but I have never used dandelions in this way before. It sounds neat! Hi Abbi, It’s always fun to find new twists on things! :) Dandelion flower oil can be used in all sorts of body care products – it’s great stuff! My dandelions have been drying for two days and today I will be adding them to a jar with an oil. Since the jar will be covered with cheese cloth for allowing extra moisture to escape, I assume not having the oil in an air tight container won’t affect the oil? And no need to shake the jar occasionally? Thank you! I had aphids on my dandelions. I tried to knock them off, and then let my flowers sit for a few hours. They closed up, so I threw them away!! I’m kicking myself now! Especially after I read you let them dry a day or two! Now to find some more flowers!! Oh dear! At least the good thing about dandelions is that they keep coming back! :) Even after the first spring flush of them fades out, you can pick a couple per day and let them dry until you get enough to make your project. 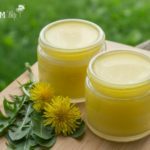 Can melted beeswax candles be used in you dandelion flower salve recipe? Hi Louisa, If you’re 100% sure that they’re beeswax only, you could probably do so in a pinch. If they have any added colors or scents though, then I would avoid using them. this is awsome, would it be good for very dry skin,a substitute to a body lotion? Hi Michele, I have dry skin, especially in the winter, and I find lotion bars really soothing. Plus they’re easier to apply than lotion; you can kind of spot apply them. On the flip side, I like my homemade lotions & creams too! :) But as far as healing my hubby’s extremely dried out hands – these have done more to help than anything I’ve tried to date. Can you use jasmine instead of dandelion can you make the oil the same way? Hi Kathleen, Yes! Jasmine oil would be lovely in this recipe. Sounds great. Would this work for eczema too? Any suggestions of other plants/flowers/herbs/oils to add for this purpose? Yes, dandelion would be great to try on eczema. Some other ideas for infusing would be: calendula flowers, plantain & violet leaves. Tamanu oil is also excellent for clearing up skin conditions. Hi Katie, You could do that, though I’m not sure how much heat would affect their properties. You might want to just air dry. I notice that no herbal place (that I’ve found) sells the dried flowers and most traditional herbal recipes call to use them fresh. I have no scientific data either way though and find that ones I’ve dried for several weeks, still make an excellent product, so that’s what I go on! i make my own lotion also…i may try dandelion oil…luckily we are coming right up on dandelion time. i like the idea of the bar…i already put my salve in a chapstick container (would work for you stuff too…nice purse/pocket container)…maybe i will try a mini batch of my stuff with your proportions and dandelions. Yes, lotion bars are great in tube form too! 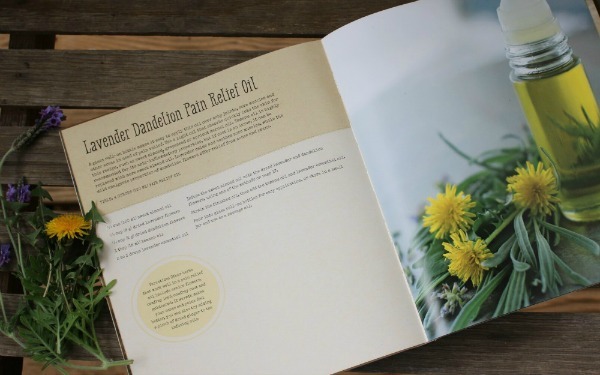 I think you’ll like the dandelion oil and find lots of uses for it in your favorite recipes! Id put the jar in my crock pot instead of on the stove for a few hours. I was curious to find out where you buy shea butter or mango butter. Is it the same as shea butter hand lotion that they sell in the stores? Hi Judy! I buy my butters from mountainroseherbs.com or brambleberry.com. 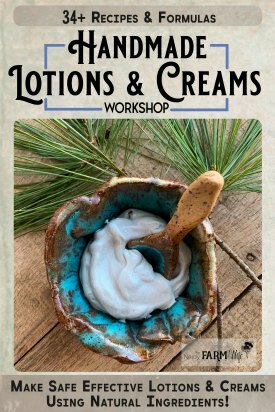 I’ve looked in my local stores but have only found the lotions you mentioned – unfortunately, they have a lot of extra additives that won’t work in this recipe. You want 100% shea or mango butter. I just got started making a batch of Dandelion Honey today! Growing quite fond of the little blooms, I must say. I was wondering though, would soy wax be a usable alternative? I can’t use beeswax because I’m a Vegan, hence the Dandelion honey, lol. Hi Jessica! I’ve not worked with soy wax, but have substituted beeswax with candelilla wax before. You can get it at brambleberry.com. Start off by trying about half as much candelilla as the recipe calls for beeswax. (i.e. if recipe needs 8 tablespoons beeswax, use 4 tablespoons candelilla.) You can also try sunflower wax, which I’ve worked with only a small bit. (But, it was very nice.) For that, start off by testing 1/4 as much as a recipe calls for beeswax (i.e. 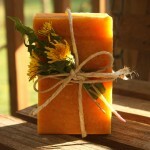 if recipe calls for 8 tablespoons beeswax, use 2 tablespoons sunflower wax.) These are just rough starting points, you’ll want to make small test batches to find that sweet spot you’re looking for! Is there something in the dandelions that is healing to the skin? Or is it the other ingredients ? Hi Kathi, Traditionally, dandelion flowers have been used to treat sore muscles and rough skin. There’s something in them that really does help both conditions. If you can’t get dandelions though, you could also try calendula flowers, plantain or violet leaves. Tamanu oil and rosehip seed oil are also great skin healers and could be used for the oil portion of the recipe. I would never have thought of using a mason jar lid as a mold but it’s a perfect idea . Just pop the lid out of the ring , that way there is no damage to your product . Look forward to more ideas like this . Hi Merry, I’m glad you found the idea useful! About how many mason jar size bars would you get from a pound of was and Shea butter? Trying to grasp the cost to make for gifts. Hi Cheri, I just weighed my last canning lid lotion bar on hand & it’s .6 ounces after being used quite a bit. So, if one bar weighed up to an ounce (just a guess though, they’re probably a bit under that) then… one pound each of wax/shea/oil would make… about 48 round bars?? Math is not my strong point, so you’d want to double check those numbers and keep in mind it’s a very rough estimate. Thanks. Sounds like reasonable ball park math. Out to do some exploring the resources. Is there an advantage to letting the oil sit for 4 weeks rather than warming it up? I am looking forward to making these with the garden season upon us! Either way works! I make my initial batch by warming the oil, since I’m always anxious to use it right away, but for later batches, I usually just let them wait out the 4+ weeks. Could you sub coconut oil to make the dandelion oil? Hi P R, You sure can! 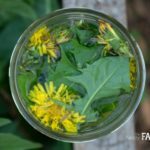 I show in this post: https://thenerdyfarmwife.com/whipped-dandelion-coconut-oil-moisturizer/ how to infuse coconut oil with dandelions. Hello, thank you for sharing this fantastic idea! I’m wondering if you have an idea of the shelf life of these bars? My family has a “Homemade Christmas” rule and I would love to make these for my hard working homesteading parents but due to the oil content am not sure if they would be okay sitting for six months or so. Maybe they could be frozen? I would actually just make up the oil now and keep it in a cool, dark place and then make the lotion bars later, near Christmas. I used dandelion oil made last May, to make salves up this past December and it worked perfectly that way. Just make sure your dandelions are completely dry before infusing the oil, so no moisture content could cause potential early spoilage & you should be good to go! Hi Somebody, I’m just not familiar enough with candle wax to know the answer to this. I would check with the wax manufacturer and see if they think it’s safe for use on skin. If there is an Orthodox Church nearby, go and ask if they would mind you recycling the beeswax candles that the parishioners light before the service. Our church just gave me a whole box full that they were going to throw out. They are 3-4 inches long, and I can melt them down and remove the wicks. I threw my dandys in the dehydrator to make sure I got all the water out and now they are white! Can I still use them to infuse? hmmm… that’s a good question that I’m not sure of. Sometimes, a few of my dandelion blossoms turn to white fluff when dried & I just toss them in with the rest. If they all are though, sounds like they might have been in too long. I generally air dry herbs & flowers and save my dehydrator for fruits & veggies. (but not always!) Maybe next batch, you could air dry some and compare the outcomes. Do you think I can use a stone mold like for shortbread? 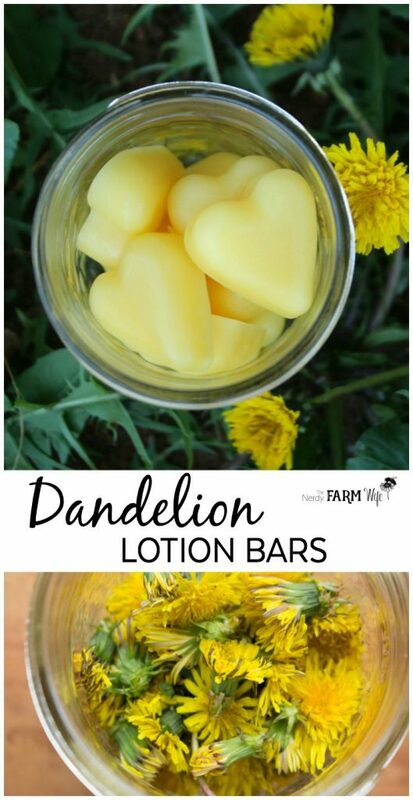 I picked a pile of dandelions this weekend and can’t wait to make this wonderful little lotion bars. I’ve noticed that many of my formerly-yellow dandelions are turning fluffy, like they are going to seed. I didn’t pick them this way! :) I won’t be infusing those, but do you know of any trick to identify the youngest (freshest) dandelion blossoms so I don’t do this again? Thank you! I wanted to say thanks, too, for sharing all these fantastic projects on your blog and newsletter – I am a new soapmaker and have been having so much fun reading through all your botanical posts! Just wondering if this would help my husband. He suffered 2nd and 3rd degree burns a few years ago and even though they have healed, he still has issues with dry itchy spots where the burns were. It’s definitely worth a shot! I’ve heard some great stories about how dandelion oil/salve/lotion bars has been helping out all sorts of skin conditions! Two other oils that might help him are tamanu oil or rosehip seed oil. Both are great for scarred and damaged skin. First, let me say that I just stumbled upon your blog site and I LOVE, LOVE, LOVE it!!! I’ve never had a lot of experience with gardening but am learning by trial and error. My dream is to one day (many years from now) have a beautiful English garden where I can spend hours planting, harvesting and just being happy! Now, to my question: We have a wonderful dog who enjoys the entire yard. He especially enjoys watering the dandelions;) Can I wash my dandelions thoroughly to ensure they are clean, and just dry them out a little longer for the recipes you have listed? I was planning on making these for my son who has eczema but was going to use coconut oil instead since I found out that Coconut Oil is recommended for the condition. Would the measurements be the same as with mango or shea butter? Hi Lisa, You would actually use the coconut oil instead of liquid oil, since it melts so readily at body temperature. If you use it instead of shea/mango/cocoa butter then the bars will be too soft. Unless…. you might be able to add more beeswax to firm them up again, but that’s something I haven’t experimented with to know the proper amounts. (In theory though, it should work!) Some people have great luck with coconut oil, while others find it leaves their skin more red and chapped. I hope it helps him! I made these for the first time today, and they were so easy and turned out LOVELY! I’m very pleased with them. I used mango butter instead of Shea butter, just because. Wonderful! I’m happy you like them! Stopping by to update you a bit. I made the lotion bars with the coconut oil instead of the shea butter. At first they were far too soft. So I remelted them and added more beeswax. I think I got the proportions right that time. I gave one to my son and his girlfriend liked it so much I gave one to her to try out. So far so good. I also gave one to my mother to try as she gets horribly dry skin but cannot use many lotions due to sensitive skin. She told me today that she has used it almost every day on the worst patches of dry skin and there has been no bad reactions and her skin is softening and healing! So success! I will tweak the recipe a little though as they still get a bit softer than I like. But so far the response as been great! That’s wonderful Lisa! With the warmer weather, they may need a bit more beeswax plus if you live in a really hot area, you might want to use some carnauba or candelilla wax for part of the beeswax. Since they have higher melting points, they’ll keep things firm a little longer. Hi Karen, You sure can! I was wondering if I can use candula infused oil in this lotion bar? Hi Lisa, You sure can! You can use other oils too – like violet leaf or chamomile. The recipe is really flexible! Hi, I was wondering if you remember where you got your mold for the heart, I’ve been looking for a good one to use for lotions or soaps. Hi! Love this recipe! Only problem is we don’t really have dandelions in Florida (I know some would think I am crazy to want them!) Has anyone seen anywhere you can purchase the dried flowers? I would really like to make these! TIA! Thank you for the reply! I wasn’t able to find any either with Google searching. probably for the reasons you suggested. Funny most find them a problem and I am looking for them, lol! One of the posts I did find said if found in FL they are not real dandelions. But I did find calendula on line so going to try that. Thank you for the recipe and info! That is funny! I have a relative whose neighbors thinks she’s crazy because she’d go get their dandelion seed heads from their yards before they mowed, so she could shake them into her lawn. (She REALLY likes my dandelion soap & wanted to keep me well supplied.) :) I’m glad you found some calendula to try! Jan, wonderful idea! I used to make/sell soap, balms, lotion etc but have been away from it for many years; I find I miss it. 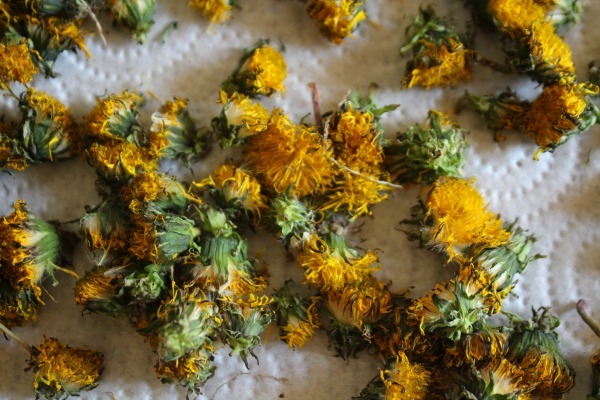 I didn’t know you could use dandilions, but I’m curious why you don’t have to dry dandelions longer like you do with calendula? Do dandilions not cause spoilage the same; not as much water content? Could you use coconut oil instead of Shea? I am allergic to Shea and don’t really care for mango. Guess I’d better get that huge packet of dandelion seeds I bought planted!!! Would this work on dog paws? Yes, it works great on dogs! I use it on mine with no problems. My comment is actually a question. And I’m a total ditz here but… I would love to make soap and lotions. Question is… beeswax, is this the same bees wax used for making candles? I’m sure it’s a silly question. But I want to be sure. I’m such a noob. Where can I get bees wax and Shea butter to make this? I’m excited to try it. If this bar was made with coconut oil, would it work for using to shave my legs? I am using just cocnut oil now, but it is kind of messy in the shower. Hi Debbie! I think you could work up a bath melt of sorts for the same purpose. Perhaps use a hard butter like cocoa butter & dandelion infused coconut oil, melt them together then pour in little molds. (Skip the beeswax, it’d be bad for your drains.) The warmth of the shower should soften them enough to rub onto your legs. I like that idea – thanks for sharing it with us! I’ll have to experiment with that too! Hi Marianne! You don’t need much at all to make a batch of lotion bars. I just did a quick weight check and 1/4 cup of mango butter is about 1.5 ounces and 1/4 cup beeswax is about .8 oz. So, you only need the smallest package of everything. I hope you find them as helpful for your hands as our family has! Thank you!!! I”ve placed my order and am gathering the flowers… LOL. just had a few days of rain and they are popping up everywhere!!! I’m in the process of collecting my dandelions. Is it ok for them to dry more than 2 days? Because I just do not have enough right. ha! Hi Sandy, You sure can! I sometimes let them dry for a couple of weeks, when it’s later in the season and only a few at a time are popping up. Hello! I was drying mine and they turned into pretty puff balls after two days. Besides growing more dandelions, can these still be used in the oil? Are your equal parts by volume or by weight? Thanks! Hi Marian! I use equal parts by volume. In warmer weather, you may want to use a bit less liquid oil if you find they get too soft. Thanks. Looking forward to making some. I seriously hope you people put a sign out with these soaps telling guests what they’re made out of (with an alternative soap next to them! ), because a lot of people are really allergic to dandelions. I can’t even imagine what would happen if I washed with these! Hi Natalie, Thanks for your comment – my oldest sister is allergic to dandelions too. It’s always good to tell people the full list of ingredients in something homemade, especially if you know they have allergies, or if you are the person with the severe allergy to something, to check before using any unlabeled product. Thanks for the reminder for us all! How do you store the dandelion oil? After the 4wks fo you strain?? And how long does the oil keep?? Thank you. Hi Halina! After you strain the dandelion oil, pour it into a clean jar and place a lid on it. The oil should keep at least 9 months to a year, in a cool, dark place – like a cabinet or cupboard. Thank you for the wonderful resources you provide on this site!! I read your PDF describing how to make the dandelion infused oil. I made a double infusion with almond oil. I put some in a glass roll-on bottle and added a few drops of lavender essential oil. I have been using this on my arthritic knee. I have the pain mostly under control with herbal supplements (turmeric, willowbark and such) but there are times in bed or in the mornings that I feel pain. This little bottle of dandelion infused oil with lavender essential oil relieves my pain almost instantly! Tonight I made these dandelion bars to try! Hi Anna, I love your idea! I wish I had a roll-on bottle on hand so I could try it right now – I shall have to order one soon! I know that your tip will help others too; thank you for sharing with us! I love this and I can wait to make some! Was wondering though. Can I dry the dandelions in a food dehydrator on the herb setting for longer storage of the flowers? Do you think a combo of coconut oil and beeswax could be subbed for the Shea butter? Thanks! Regarding weight vs volume: Since the beeswax and shea butter are solid(ish) and the oil is liguid, how do you calculate equivalent volume? Hi Kayce! I just use the same measuring cup for everything: beeswax pastilles, oil and the butter – which I just squish in and roughly level off with a knife. It’s a pretty flexible recipe and doesn’t need a lot of precision – you can always remelt and add more oil if they’re too firm or more beeswax if they’re too soft. Here is a recipe that I found that uses weight instead of volume that you might like: http://www.otionsoap.com/blog/2010/07/01/lovely-lotion-bars-2/ You can just use dandelion infused oil place of the plain oil called for in the recipe. Hello! When your infusing the oil using the fast method, do you use a lid or keep it open? Hi Jessleasman! I keep the lid off. Anything for buttercups or daisys ? Have dandelion oil going now. Love the idea of using wildflowers. Do you think you could put dandelion flower on lotion bar and put a little wax on it to keep it in place? . Hi Sue! Sadly buttercups are toxic – not just to humans, but to dogs, cats & farm critters in general – so I don’t use them in anything. Daisies however, have some interesting skin healing properties, so you can use those in salves. I like your idea of a dandelion flower pressed on with wax! Perhaps if you pressed it first it would hold up well? I’m not sure, but it’s worth a try! Where can I find beeswax and shea butter? and my friend has given me a little bit of shea butter, but where do i find these in large quantities??? Hi Elica! Some good sources include BrambleBerry.com or MountainRoseHerbs.com or Amazon.com. I live in a rural area, but we have a couple of stores around (1 health store and 1 Amish type store) that sell those items, so perhaps there’s something like that near you as well. Hi Elica, They might have some or if not, might be able to order you some! I forgot about local farmer’s markets too. There’s often someone there selling honey and they may have beeswax as well. Hi again, Jan. I don’t know if I will be able to get some, so I am wondering what are some replacements/ substitutes for beeswax and shea butter that are house-hold items? Also on the verge of honey, do you know where I can get some honey combs (with honey). I’ve seen then by a natural company, but I didn’t buy some and now I can’t find any that is under 20 dollars. :( Well, thanks for the advice! Hi Diane, You sure can! Your oil should be good for at least 9 months to a year. Glad you found the answer and I hope you enjoy your lotion bars! I have been saving your recipe and made some last week. My hands were pretty bad from gardening, woodworking, masonary eats. This is the best treatment I have ever used. I am making more today to have at my craft show booth. Hi Ed, I’m so happy that the dandelion lotion bars helped your hands! I hope they sell like hotcakes at your craft show booth! How do you make the cute lotion bars into cute little hearts? Where do you find molds like that? Hi Phoenix! I found those locally a few years ago, around Valentines Day I believe. They’re originally a candy mold. (You can use candy molds, flexible ice trays and other silicone types as long as they’re fairly heatproof.) Check the baking section of local grocery stores and also their holiday sections – especially now, with Valentine’s Day items out, you should be able to find some cute heart-shaped options! Michael’s and other similar type hobby/craft stores usually have a baking/candy section too you can raid for lotion bar molds. Most people then take that number and double or triple it to cover the cost of labor, plus taxes if you’re a business. You can compare that number to what the going rate is – check Etsy and see the ballpark amount other people are charging. My sister, a nurse with chronic back pain, also had her first pain-free sleep in months after applying the salve, so I’m now making more for her, and my other sister who just had a knee replacement! Anyway, I had a quick question. Would the lotion bars, with the addition of the Shea butter, have any affect on the analgesic properties, which we’ve experienced in the salve? I think the lotion bars would be really convenient for my neighbour, and for my own clay-dried hands (I’m a Potter), but don’t want to lessen the benefits. Thanks for your great site. Because of you, I’ve discovered my hidden home herbalist, and hope to learn lots more in the future. Hello there! I just wanted to drop a comment here of appreciation! Due to some genetics on my Dad’s side of the family, he, my sister, and I all have varying cases of Palmoplantar keratoderma. Basically, it’s like having working callouses on the palms of your hands and the bottoms of your feet. My dad’s a retired military redneck, my sister plays Softball, and I just left the military myself, so we’ve all been searching for AGES for something help out our hands and feet (not to mention, my dad’s a bit self-critical about it). We’ve tried everything from lotions to salves with acidic properties, my uncle (who’s also got it) even tried to remove it with a surgical laser! Nothing seems to help! On a creative fling, I decided to try and make these lotion bars of yours, and I can’t BELIEVE how much they’ve helped! It even helps the aches and pains my feet get when the weather changes! Today, I’ll be going out to get more shea butter and beeswax, because Father’s Day is coming up, and thanks to you, I know exactly what to get him! From a family struggling with genetic callouses, thank you, thank you SO MUCH!! Hi Leslie! It depends on the size of your mold & how you scale the recipe, but the amount given will fill almost two dozen small (one-inch) hearts or several larger sized shapes. How can I add magnesium oil to this? What would the amount be? After you pick the dandelions, do you just let them sit on paper towels for two weeks to dry? I’m a little excited to try this out, and the idea of waiting weeks is killing me. :) Also, do you use the whole blossom when infusing the oil or just the yellow petals? I hope you enjoy your lotion bars! I really enjoy your blog, books and just simply adore you and the way you write. I am in a bit of a pickle at the moment and I hope you can help me: for the infusion do you use sunflower oil or sunflower seed oil? Plus as the summer heat is upon us (I live in Italy and cannot use your links as simply the co. won’t ship overseas) do you have a suggestion on how to store them without them melting and having a quick and easy way to apply them for kids? Thank you in advance for all your help and for simply existing. Keep up the good work, I really look forward to all that you write. Hi Ana! Thank you so much for the kind words! :) I believe that sunflower oil and sunflower seed oil are likely the same thing, probably with just different naming on the labels. 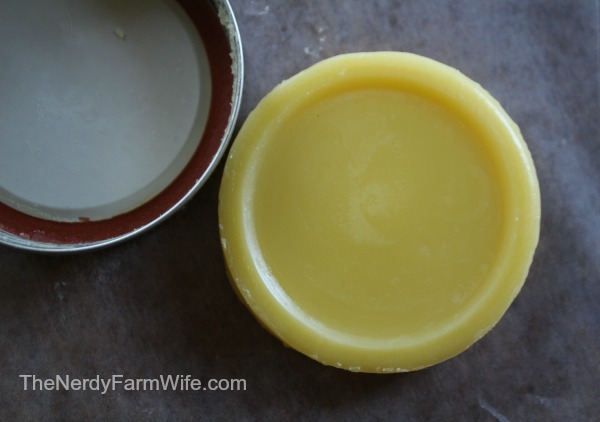 When it’s hot out, you can try adding more beeswax to the lotion bars so they don’t get melted so quickly. Also if you have candelilla wax, you can add some to the mix since it has a pretty high melting point. For kids, you can also add some extra beeswax and pour the mixture into an empty deodorant container (plug any holes in the bottom first so it won’t leak.) Then you could make a rub-on stick that might be easier to apply. Hello, I have been saving this recipe for several years and am finally making these bars this summer. I have a quick question, I’d like to try making the salve the “long” way and am wondering about the glass jars. Can I use an old pickle jar whole lid is not totally air tight or does it need a screw top lid? Thank you. Very excited about this! Yes, an old pickle jar is great to repurpose for infusions. It doesn’t have to be air-tight, you just want it to keep flies and dust out. I hope that you enjoy your lotion bars! There are hundreds of dandelions all over my property, but the dogs are also all over the property taking care of their business wherever they please. I wouldn’t want to use soiled flowers in my body care products… Right?